The crypto market continues its bearish trend, pushed on by the mining war between BCH ABC and BCH SV, with BTC slumping to a new yearly low of US$ 3585. This slumping BTC price contributes to the bearish momentum of the crypto mining industry. Recently crypto mining firm Gigawatt filed for bankruptcy with its liabilities being 1,000 times higher than its assets. Shrinking mining profitability no doubt contributed to Gigawatt’s bankruptcy. As noted in our Chart of the Week, total miner revenue at one point dropped to US$ 6.18mn in the wake of the BCH hard fork. This leads to the exit of BTC miners, and a subsequent 4.3% drop in the BTC hash rate and 24% drop in the BTC energy consumption. Some mining pools have also fallen victim to the bearish market, with the BTCC Pool ceasing operations after November. The exit of miners and mining pools will likely lead to further centralization of BTC mining. We are noticing a significant increase in the quantity of mining equipment being put up for sale by crypto miners. 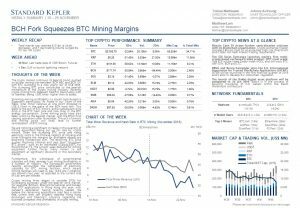 Given the slumping BTC price and rising electricity costs in the Chinese regions of Xinjiang and Inner Mongolia the margins for profitable mining are becoming increasingly slim. The declining BTC price pushes machines towards and past their “shutdown BTC prices”, such as an estimated US$4,643/BTC for the Antminer T9. The current weak demand for mining equipment further forces many miners to sell equipment at significant discounts in the secondary market. Furthermore, the withdrawal of governmental subsidies will likely severely hurt mining profitability in a number of regions. The Norwegian government recently announced the withdrawal of electricity subsidies for BTC mining facilities, which means mining facilities will need to pay 16.58 øre (~US$0.02) per kilowatt next year, as opposed to the current rate of 0.48 øre per kilowatt. Crypto mining firms began to consider IPOs for fundraising purposes under the bearish 2018 market. For example, Bitmain, Ebang International and Canaan filed IPO applications in Hong Kong this year, with Canaan’s application having recently lapsed. We believe the remaining applications may face a similar fate, unless they can properly address Hong Kong Exchanges and Clearing’s concerns regarding the business prospects and profitability of crypto mining.